We are RTITB accredited and offer the highest standards when it comes to forklift driver training. Norlift instructors are fully qualified, experienced and able to train operators on customer premises. Norlift LTD. now covers all of main land UK and has over 20 years training experience. We offer an indepth range of RTITB accredited training courses. 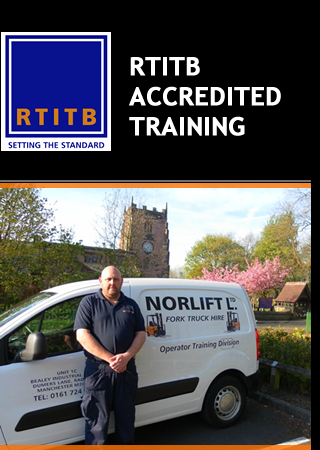 Norlift instructors are fully qualified, experienced and RTITB accredited to train operators on customer premises. We adhere to only the highest standards and offer competitive prices at all times. Contact Norlift Limited for much more about all of our forklift driver training services.